We first noticed Scoobie on the Midwest BREW website right around Christmas 2012. He was pictured wearing a huge red bow, with an odd, distinctive head tilt in one photo and a giant sleepy yawn in another. When Christmas, and then New Year's passed him by and we saw countless other younger dogs (especially the puppies) being adopted, we realized that the chances of someone wanting an old white-faced Beagle who was nearly blind and almost completely deaf (the head tilt a result of an apparent stroke, causing the right side of his face to droop) were slim to none. The town that we lived in only allowed three dogs per family and we were at our limit. However, persistence paid off and we were granted permission to help a dog who had little chance of finding a forever home. And in April 2013 Scoobie left his wonderful foster parents and became Carol's true "mama's boy" (for those of you who knew Scoobie you know EXACTLY what I'm talking about). For almost four years he was the most amazing dog imaginable, at first relentlessly attacking the trash can in our kitchen or howling non-stop as his meals were being prepared, and in later years wandering aimlessly for hours on end, looking for that perfect spot for a nap or growling at his younger brothers if they tried to coax him into a little roughhousing. The one thing that never changed was his incredible appetite and the barking that would begin the minute his food bowl was picked up. 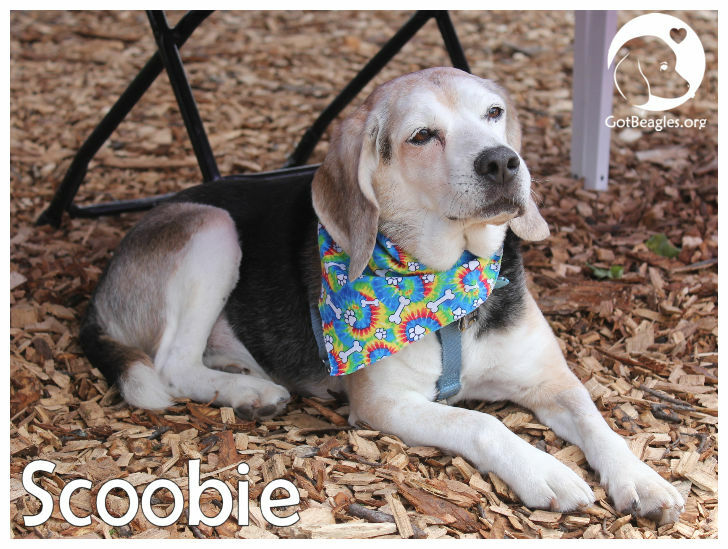 We thought Scoobie was a "goner" several times: Congestive heart failure, excessive fluid build up in his lungs, chronic and severe back and leg issues, and a cough that would not go away no matter what medication was prescribed. But he always bounced back and proved the veterinarians wrong. When dementia set in, Scoobie began to bump into walls and find himself stuck in a corner or trapped under a table, and we knew that his time was coming to an end. He could not sleep through the night, slept most of the day and, reluctantly, wore a belly band 24/7 except when he went outside. As Christmas 2016 approached, his hind legs began to give out on him, leaving him sprawled out on the floor and looking up at us with his cloudy white eyes that seemed to ask, "What has happened to me now?" The final blow was a torn cruciate ligament. Too old and frail for surgery, we made the humane yet heartbreaking decision to send him on his way. Scoobie spent his last weekend relaxing (the same as always), sleeping a lot (the same as always) and howling for each and every meal... the same as always. Every dog is special. Scoobie was just a little more special than all of the others. You'll always have our love. Your memory will live on."